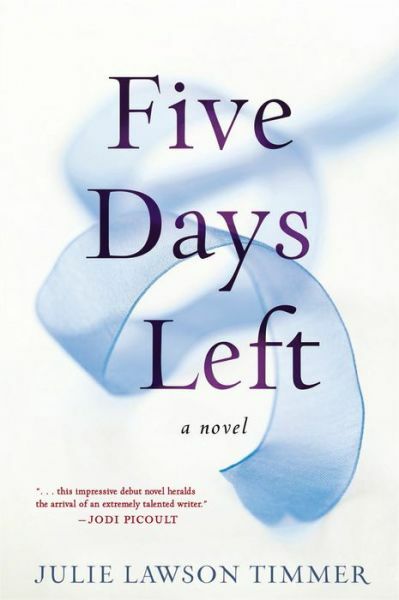 Five Days Left tells the story of two people, Scott and Mara, who are both facing difficult, life-altering decisions over the course of the next five days. Scott, along with his wife Laurie have been fostering a troubled boy for a year, and that year is almost over. Unlike his wife, Scott is having a hard time letting go. Mara diagnosed four years previously with Huntington’s Disease is facing the decision to end her life to spare her family and friends the burden of taking care of her as her condition worsens. Their stories intersect through an online group for parents of adopted and foster children, Mara having adopted her own daughter. One weakness of the story lies in that thin connection between the main characters. Either could stand alone, and sometimes the gravity of Mara’s situation outweighed that of Scott’s, though a foster parent in his place might not agree. Debut author Julia Lawson Timmer seemed to lean heavily on telling Mara’s story more than Scott’s at times; the incident in the pharmacy comes to mind. Though the reason for Mara’s trip was no doubt embarrassing, the length of time taken to read it felt excessive for a scene that probably lasted 5 minutes at most. Another aspect that didn’t feel authentic was Scott’s wife attitude. It read more like a tired trope. The resolution of it also felt a bit too after-school special. The novels ends about how you expected it to, with one happy ending and one not, brought on by too convenient plot devices. Bring tissues along for both either way. What really affected me while reading Five Days Left and what would probably appeal to book clubs are the questions I asked myself throughout. The foremost being what would you or I do in those situations? A question for which I still have no answer. Could you give up a child you loved because the courts say it’s best for him to be with his biological parent, though it’s obvious that couldn’t be farther from the truth? How do you go from being a high-powered litigator to not being able to hold a glass or your child? How would you have handled saying goodbye to the people you love most in the world? Fives Days Left will leave you thinking that the lines between selfish and selfless are far more blurred than we’ve all believed. I received this book as part of Penguin’s First to Read promotion.